I've attended the Gathering 4 Gardner 3 times. It's a bi-annual event. The last time in 2012. I stopped going because there wasn't enough puzzling going on and I do get my fill via the International Puzzle Party, which meets every year. 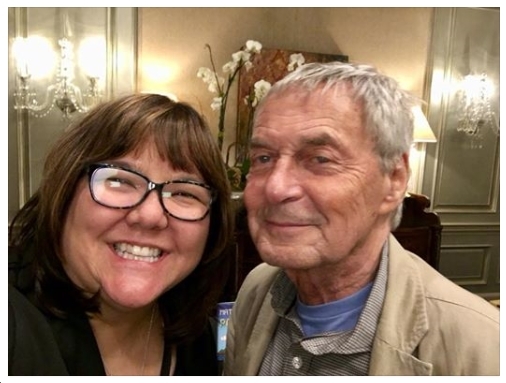 My puzzle friend Tanya Thompson posted this photo of herself with Erno Rubik. I was given a Rubik's Cube for Christmas in 1980. I fiddled with it for about 2 weeks. One Sunday, I woke up and declared: Today is the day that solve this. 9 hours later: triumph. For the last 20+ years, I've been teaching my students how to solve the cube during a 3-week mini term course. I teach them my method. It's not the fastest, but it works. We have a solving competition with a winning time of about 2:30. I can't believe I'm not at G4G.